Scientists now know that the presence of apex predators in an ecosystem has a wide ranging and unexpected effects on a living system as a whole. A ground breaking study of wolves in Yellowstone showed that the presence of wolves suppressed browsers and thereby allowed encouraged the growth of mature trees which in turn had a positive effect on life in streams and wetlands. The latest evidence of the beneficial impact of predators on ecosystems comes from Australia. A study of dingoes (Canus lupis dingo) on both sides of the infamous "dingo fence" [photo] concludes that the extermination of Australia's apex predator has an adverse effect on soil quality because kangaroo populations which feed on vegetation boom in their absence. 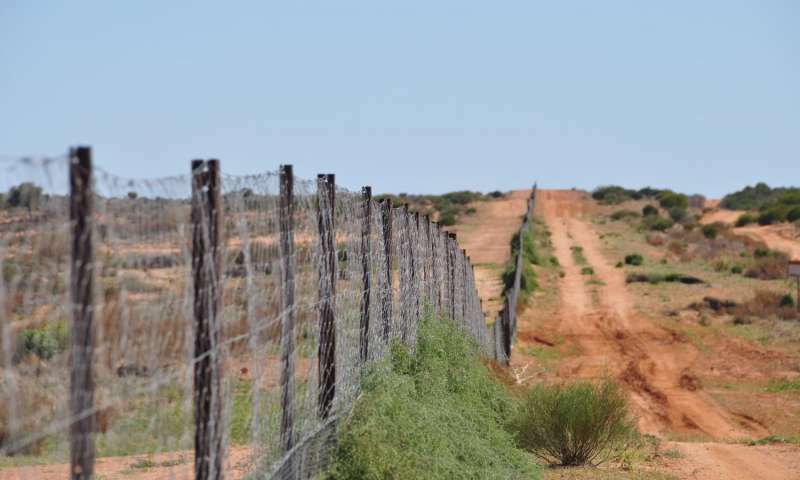 The published study by researchers from University of New South Wales looked at dingoes on both sides of the 5600 kilometer fence erected a century ago to keep the wild canines out of eastern Australia. Dingoes were brought to the Australia continent by Asian seafarers 3500-4000 years ago. Dingoes are common in western Australia. They counted kangaroos and dingoes, collected scats, and tested soil samples for four years. Overgrazing by kangaroos on the east side of the fence produced soil that was relatively poor in phosphorus, nitrogen and carbon. Their conclusion that the presence of an apex predator that feeds on kangaroos is responsible for richer soil on the western side, is contrary to conventional thinking that predators have no effect on soil health. 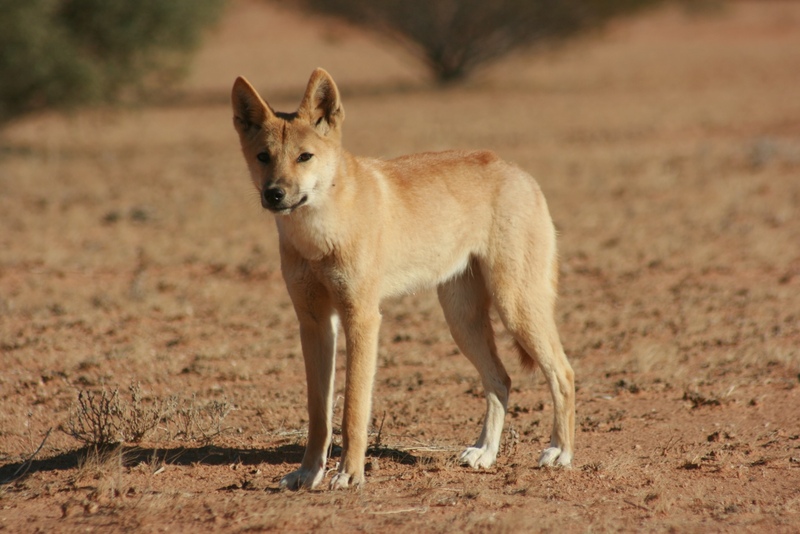 The dingoes' trophic cascade is therefore extensive, right down to the presence of soil nutrients. The study's authors urged a re-think of kangaroo control through the reintroduction of its main predator in areas where there is an overpopulation of the marsupial such as in national parks that are at risk of becoming kangaroo 'farms'. Another published study of the affects of dingo extermination in eastern Australia shows that the loss of dingoes there contributes to the loss of small mammals who are prey for non-native cats and foxes. 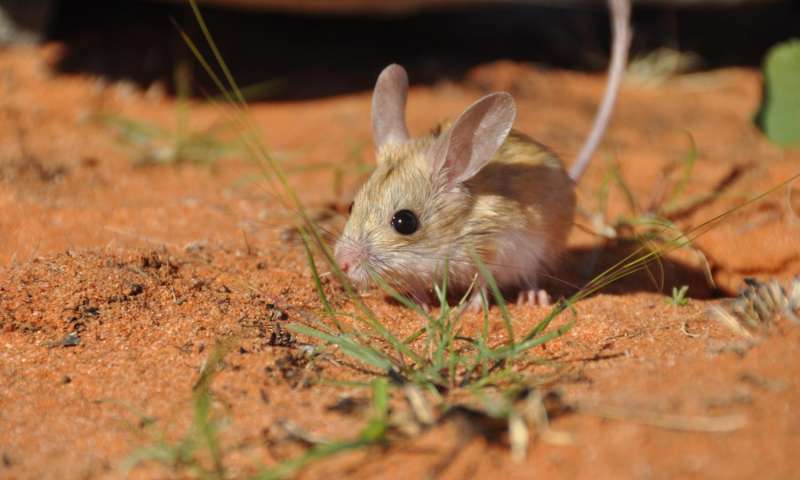 Small mammals, such as the dusky hopping mouse [photo], eat shrub seeds which keeps them under control. Shrub cover in selected areas of the Strzelecki Desert is 26-48% more dense where the dingo has been exterminated.